"We're talking Stokes, Buttler, Woakes - a hundred and wickets a Lord's - Moeen Ali, Sam Curran. That middle order has been magnificent." 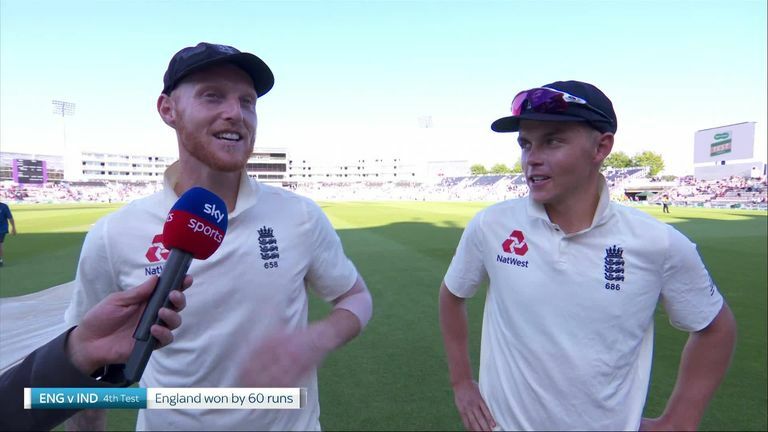 England have their "magnificent" middle order to thank as they celebrate a Test series win over India, according to Nasser Hussain. Joe Root's side take an unassailable 3-1 lead into Friday's fifth Test at The Oval after a 60-run with at the Ageas Bowl with recalled duo Moeen Ali and Sam Curran making vital contributions. Hussain also pointed to performances from Ben Stokes, Jos Buttler, Chris Woakes and Jonny Bairstow as being crucial to the outcome of the series. "I think this series was decided in the middle order," he told Sky Sports Cricket. "We're talking Stokes, Buttler, Woakes - a hundred and wickets at Lord's - Moeen Ali, Sam Curran. That middle order has been magnificent. "That middle order compared to the Indian middle order once you get past Kohli, was like chalk and cheese. Bairstow, when he plays in the middle order, is a very fine player as well. That is England's strength and is why they've not lost a series at home since 2014." However, despite another impressive win on home soil, Hussain believes England have still got plenty of room for improvement. "I don't like to get too down when you lose or too high when you win," he added. "We've been through this cycle, we win at home, we're brilliant at home but if we were setting off for that Ashes series in Australia again now, would I have Moeen Ali as my frontline spinner? No. "Would I have Chris Woakes as my main bowling all-rounder? No. Would I need some extra pace? Would I need a left-armer? There are still some questions to answer but in these conditions, in this country, this is a very, very difficult side to beat." Having been dropped from the Test side during the tour of New Zealand, Ali certainly appears to have begun making those improvements and, having taken nine wickets in the match, was named player of the match at Southampton. "He's gone back to Worcestershire, he's worked seriously hard and he's come back and out-bowled Ravi Ashwin. Comfortably out-bowled him in both innings," Hussain said. "He's been brilliant, he got his pace right, he hit those foot holes better than any other spinner in the game. He got good players out, he wasn't just coming on and mopping up the tail, he got top-order players out. He got runs as well. "What a phenomenal cricketer he is. Yes, he's got work to do away from home but in this country he is a very talented man." Watch the fifth and final Test between England and India live on Sky Sports Cricket from 10am on Friday, September 7.